The city of Gortyna, or Gortys, in the Centre of the island near the river Lithaios, was the equal of Knossos in terms of wealth and importance. 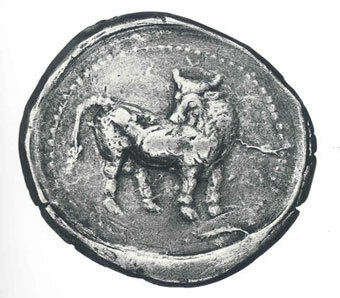 Gortyna was the first of the Cretan cities to issue coins, on which the myth of the abduction of Europa was revived. In honour of Europa, the city celebrated a festival called the Ellotia, the origins of which were apparently associated with the moon. The issues of Gortyna are like a diptych. 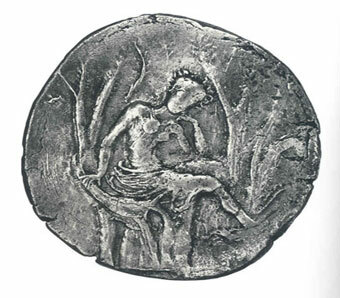 On the obverse Europa is depicted sitting in a tree, probably the willow. An eagle sometimes sits in the branches of the tree. The bull engraved on the reverse symbolises Zeus. According to the legend, Zeus transforming himself in to an eagle. Europa was the nymph who gave her name to the continent of Europe.